Nolan is a happy-go-lucky 1 year old, 50 lb. 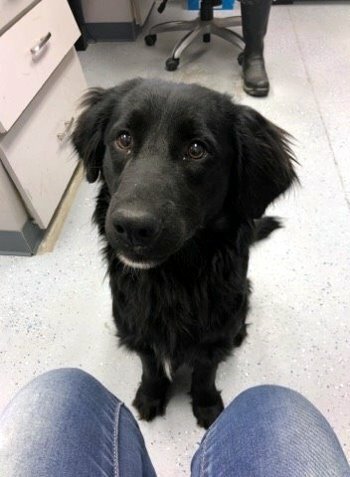 Flat Coated Retriever/Spaniel mix. With his shiny and soft coat and gentle eyes, he is as handsome as they come! His tail never stops wagging, and he loves making new friends (humans, dogs, and cats). This affectionate guy always has kisses for his humans, and he loves being pet and cuddled. When you stop petting Nolan, he will very gently put his paw on your leg to ask you to keep giving him attention. This awesome boy can’t wait to light up the life of his new family!